In Jeff Adams world, there is no clear dividing line between coaching and logging, which may help explain why he is possibly the only logger in Idaho history to have ever been named the Idaho High School Athletic Association’s Division 2A Coach of the Year. It is the beginning of a riveting tw0-hour conversation with one of the most inspiring young men I’ve ever met. It took him three weeks to return my phone call, but when he finally did he suggested we meet in the conference room at Northwest Insurance Agency on Main in Grangeville. I was soon to learn that the conference room doubles as the war room for the coaching staff. Every wall was papered with diagrams of offensive and defensive plays. Jeff Adams exudes a kind of sincerity, confidence and dedication that is rare in today’s increasingly cynical world. Grangeville, Idaho, population 3,123, is very lucky to have him. And he counts himself lucky to call Grangeville home. Hard to believe that Adams’ indomitable spirit nearly failed him after his father died in 2009. The Great Recession almost crushed his logging business and he missed his dad’s homespun wisdom to the point where he wasn’t entirely sure that he wanted to continue logging. He credits IFG President, Scott Atkison, and Bill Higgins, IFG’s resource manager for its Lewiston and Grangeville mills, with encouraging him not to give up on himself. 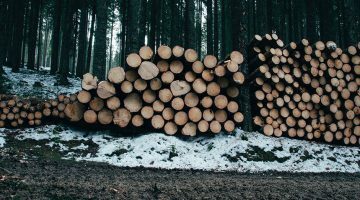 Adams did not give up, possibly because logging is in his third-generation blood; but more likely because of a piece of career advice his plain spoken father had given him years earlier. Adams knew he was a good logger, but his head was in a bad spot. His equipment was tired and so was he. Worse, the mechanics of logging were changing rapidly, and he knew he was finished if he too didn’t change. So with the memory of his father’s voice in his ear, he doubled down on his own future prospects. Over the next two years, Adams purchased five machines, one for each member of his five-man crew: a cut-to-length log processor, a skidder, a feller-buncher and two loaders – a capital investment well north of $1 million. What changed? Certainly not the cyclical nature of the logging business. These days, the future of Elk Mountain Logging looks very bright. Housing markets are strong and getting stronger, a first since the nation’s banking industry nearly collapsed in 2008. Adams’ crew is finishing up a U.S. Forest Service stewardship contract between Pierce and Weippe, above Orofino, Idaho, that has kept them away from home – save for weekends – since last spring. Their soon-to-start winter job is near Elk City, a mere 40 miles east of Grangeville. Adams is fortunate. At a time when the logging industry’s work force is graying rapidly, his crew averages a young 36 years old. Most of their jobs are on the four-million-acre Nez Perce-Clearwater National Forest – something else that separates Elk Mountain Logging from its competitors. What may make Jeff Adams unique among loggers – and football coaches – is his gift for reducing his extraordinarily busy life to its simplest pieces; except that he would say they are the most beautiful pieces. In 2011, Adams’ second year on the Bulldog coaching staff, Grangeville ran the table [12-0] and won the Idaho 2A football championship, its’ first ever. Grangeville School District 244 is not blessed with a lot of money for luxuries, like its remarkably good football program. Credit the team’s eight coaches – four of them volunteers and the other four on small stipends. As offensive coordinator, Adams gets a stipend, which he gladly hands over to his wife. Although Adams sees a bright future for his Elk Mountain Logging Company, not one former Grangeville football player has ever asked him for a job. Most likely one or more will eventually, but the first order of business for most Grangeville High graduates is leaving town – hopefully for good. Many go on to college. Others enlist in the armed services or just drift until something strikes their fancy. The town fervently hopes some of them will return one day because without them, there will be no town. Our two-hour conversation flies by. Then it is time to take some pictures. We agree to meet at the football field. Once there, we walk to the west end zone. The sun is setting over the often windswept Camas Prairie. It is at least 20 miles to the distant peaks that rise above Hells Canyon, not far from the confluence of the thousand-mile long Snake River and the treacherous 425-mile-long Salmon. Soon, it will be necessary to turn on the stadium lights. They will illuminate the playing field but be swallowed easily by the immense darkness that creeps in behind the bleachers. I try to imagine a spiraling or tumbling football disappearing into the foreboding darkness. What must opposing teams that have never played here before think about this almost surreal setting? And there are probably no other loggers quite like Jeff Adams.